The HackerGuardian PCI Scanning Enterprise Edition product allows unlimited scanning of up to 20 external or internal IP addresses. 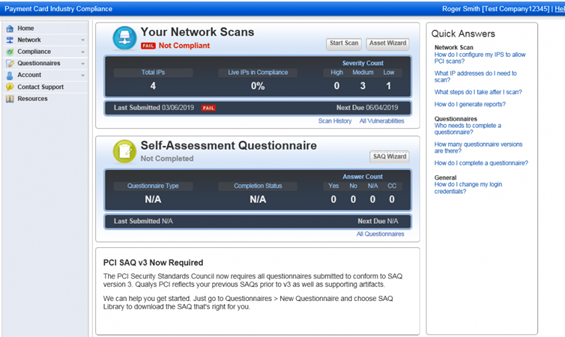 In large distributed networks, such as Web-host and Payment Gateways, HackerGuardian provides the required PCI Scan compliance on multiple servers and server types. Enable HackerGuardian's advanced reporting capabilities and also assure customers you are authorized to accept credit cards with a high visibility trust indicator. HackerGuardian PCI Scanning Enterprise Edition is appropriate for a distributed network where many payment gateways or web host desire PCI compliance scanning on various servers. HackerGuardian PCI Scanning Enterprise Edition boasts advanced reporting capabilities; delivering trend analysis and executive summaries in addition to proposing precise, possible methods of threat mitigation and guidance. We offer HackerGuardian PCI Scanning Enterprise Edition starting at only $299.00 per year, granting you complete access and control to over 30,000+ vulnerability tests. Enhance shopper confidence by displaying the Credit Card logo, a recognized symbol of your trustworthiness to take credit card details online. Failure to comply with the Payment Card Industry Data Security Standard may very well result in heavy fines, restrictions or even permanent expulsion.